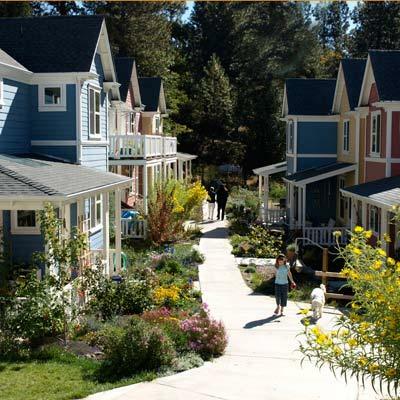 We are a 34-unit cohousing community located within walking distance of a lovely Sierra Nevada Foothill town. Over six of our 10 acres are dedicated to open space. The community was initiated by architects Katie McCamant and Chuck Durrett in 2002; the first residents moved in in 2005. We are 85 people altogether: 59 adult members, 26 kid/young adult members. This includes many elder members (55+), 10 single adult households, and 16 households with kids. Our community has many sustainable features, including photovoltaic solar for every home and the common house, sustainably forested lumber in the construction of buildings, passive cooling (air conditioning only in the common house), and hydronic heating systems for very energy-efficient, healthy homes.